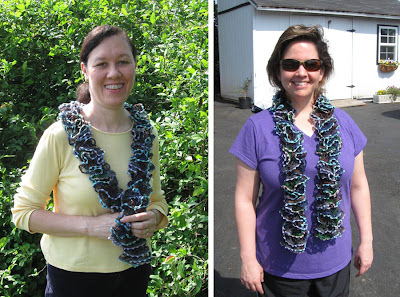 Fiber Antics by Veronica: Easy Ruffled Scarf—sassy, girly and fun! When I attended Stitches South last weekend, I brought back a show program for my knitting students to see. In it, there was an ad with a photo of a scarf that featured one of the fun, novelty, self-ruffling yarns that are on the market. OK! I'll order yarn and we'll do a quick demo at the beginning of next week's No Fuss Color Knitting class. Easy ruffled "boa" scarf made with Spectra. You can make it in an evening! I ordered two colorways of Spectra from Universal Yarn. It arrived Saturday and by Sunday, the 7-stitch scarf was finished. Deana (right) and I are both modeling the finished product. These yarns and the projects made from them are sassy, girly, and a quick knit—what's not to like? Ruffled Scarf Demonstration this Tuesday evening (May 1) at 5:30pm. Bring a pair of size 8 or 9 straight needles and point protectors or a stitch holder (to hold the stitches for traveling). E-mail me if you're not currently a student in my class but want to stop in for the demo.